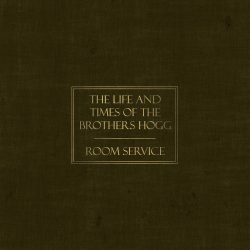 In an album review with a limited word count, a band name like The Life and Times of the Brothers Hogg takes up a lot of space. It leaves very little room to talk about their surprisingly un-rootsy origins in Eastern England, it might not allow reference to all the praises being sung about their live performances and it barely leaves any space to tell you why their new release, ‘Room Service,’ is very, very good. This is a tight band of excellent musicians that understand the core of Americana and what it means to make music for the sake of purely made music. The whiskey-soaked voice of guitarist and lead vocalist Darren Cap, mixed with the sweet harmonies of keys player Nena Mager, combine with some tightly rehearsed roots and bluegrass-influenced tunes of beautiful pedigree, to produce an incredibly satisfying sound. Often rhythmic and stomping, equally soulful and reflective, this impressive collection of songs never fails to conjure images and stories, recognisable characters and oft-seen heartbreaks. There’s a lot of nuanced variety in this 12-song album and they’re never afraid of the quiet moments, the solo roots guitar and the shamelessly traditional harmonising. Songs like ‘Darlin’ Corey’ can’t fail to rouse a fan to stomping, despite the way it sets up expectations, yet ‘Family (Oh No! )’ is an entirely different prospect and shows a band ready not to take themselves too seriously either musically or lyrically. It doesn’t stop it being good though, far from it. The title track at the end of the album is a definite highlight in an already superb album: a slow-burning, gently-opening, gorgeously-sung ode to the desire to hide away in a motel room with the object of your affection, climbing to soaring heights in the simplest way before fading to nothing and demanding another listen.